Downtown traffic in Tehran. Photo by kamshots. It came as a bit of a shock to foreign observers when the Iranian central government declared a 24-hour “holiday” last Wednesday in Tehran in response to the extremely unhealthy level of air pollution city officials were expecting, but unfortunately for residents of this megacity of nearly 14 million people, such so-called “holidays” and other fall-out from decades of irresponsible local planning have become all too common in recent years. The problem dates to the early 1980s, when the Ayatollah Khomeini made a promise to Iranians that unlike the Shah before him, he would build adequate housing in urban areas for the common people. The statement, made amidst a refugee crisis in the Southwest because of Saddam Hussein’s invasion in 1980 and the economic chaos following the Iranian Revolution of 1979, acted as a virtual invitation for poor Iranians from all over the country to move to the capital. By the 1980s, 100,000 people were moving to the capital per year, and the political and economic upheaval of the eight-year war with Iraq meant scarce resources were spent on the war effort and on housing, while long-term planning received short shrift. In the 1990s, however, the economy turned up again and the government ditched socialist planning techniques for greater experimentation with free market capitalism. 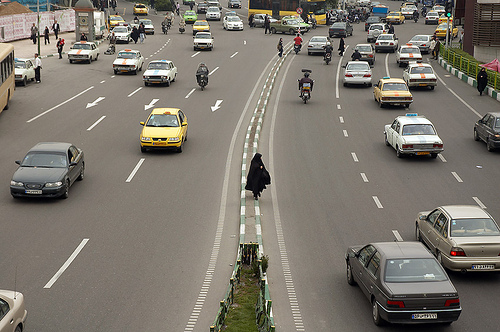 The large middle and upper classes of Tehran, finally in full recovery mode, went on a spending spree that turned small suburban villages nearby into crowded, peripheral boomtowns and flooded the capital’s boulevards, which had been designed by pre-revolution planners to accommodate the 3 million residents of mid-1970s Tehran, with cheap cars with poor fuel efficiency egged on by subsidized gas prices. The result has been severe traffic and pollution, while a great number of public spaces and open spaces have been demolished in the wave of freeway building that occurred as the city government played catch-up in the late 1980s and early ’90s. 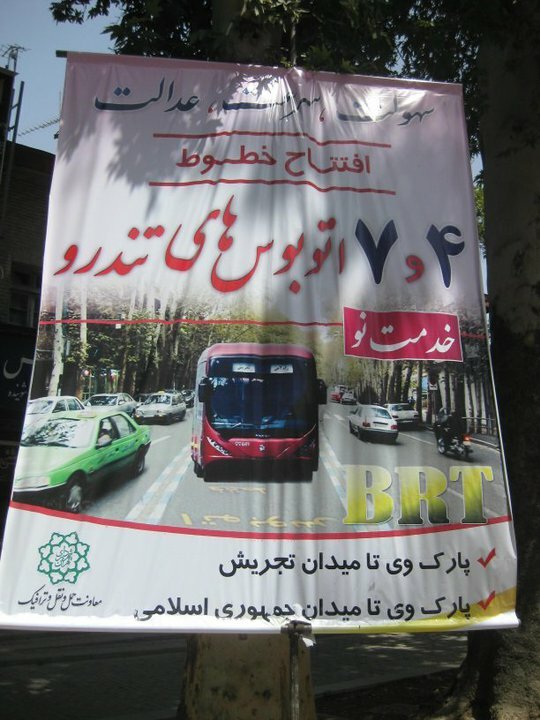 A poster advertising a new bus rapid transit (BRT) line down Valiasr Avenue, the capital’s longest boulevard. Luckily, city administrators began to tackle some of these problems around the same time. With the help of Japanese experts, air pollution monitoring has been regularized and large billboards in main squares alert commuters as to the daily fluctuation in air quality. Meanwhile, large parks and pocket parks have been built throughout the city and a city-wide program of mural painting has been implemented, creating a more cheery feel in a city dominated by cheap, character-less, and boxy 1980s and ’90s architecture. Downtown Tehran is also limited to cars with special permits during peak traffic hours, forcing commuters onto public transit. The greatest achievement of the city government over the past two decades has probably been the construction of the Tehran Metro, the first such system in this country of 70 million people. The first heavy rail line went up in 1999, and rates of construction of the mixed light and heavy rail system has just recently seem to have eclipsed freeway construction, as city planning officials have realized that an auto-centric approach has thus far failed commuters. While a trip from Tajrish Square, the northernmost point in Tehran, to Reyy, one of the most southern, can take about three hours in a car in rush hour, the trip on the subway is less than an hour. Today, the Tehran Metro boasts ridership of about 4 million people. In addition, a parallel system of bus rapid transit (BRT) lanes has been developed across the capital and is rapidly expanding as city officials race to fulfill a program to have total public transit miles exceed 400 kilometers by 2020. Meanwhile, this last September the Tehran municipality government rolled out a program for bike rental that allows city residents to sign up for about $2 a year to be allowed to rent a bike as often as they like for about four hours at a time. The program, currently in a testing stage, is expected to expand in the coming years, and one hopes it will be but the first in the implementation of progressive planning techniques in the city. Tehran continues to be the largest and densest concentration of people within Iran, and as such, remains a laboratory for urban ideas for the entire country. The success of the metro in Tehran has inspired the development of Metro stations in Shiraz and Esfahan, two other major cities. Meanwhile, as Iranian political influence has spread throughout the region over the last few years, urban planners have begun working on joint projects with local municipalities in Lebanon and Iraq. Hopefully, the lessons learned from Tehran’s slowly-improving smoggy streets will have positive implications for the urban areas of the wider Middle East.